Key Perspectives: Limitations of the Present Approach; back to basics; towards a deeper approach; vedic science of society; integration of philosophy, ethics and science; the integral aims. One of the mega-trends of the present times is that an increasing number of people all over the world are seeking for an inner psychological and spiritual fulfillment in and through life and work. This trend, which is at present only an individual need in a small but growing number of people, may become a collective need of the race in a not-too-distant future. To manage this future need of the race in a creative way requires a radical change in social theory and practice. We need a new science of society for understanding, organizing and harnessing this need for the higher evolution of the individual and the collectivity. This article presents a conceptual framework for an alternative approach to social science based on an integral approach to human development, drawing inspiration from the vision of Indian seers. One of the domains of modern knowledge, which is still very much in its infancy, is the understanding of our collective life. As two eminent sociologist’s states, “Many sociologists believe they stand only at the outermost rim of this understanding”. (1) There is perhaps much progress in knowing the laws, process and patterns of the outer forms and appearances but very little understanding of the deeper psychological and spiritual forces that shape and drive the outer forms. There are two reasons why modern social sciences could not make much head away towards this deeper understanding of human society. The first reason is a more or less dogmatic attachment of the modern scientific and secular mind to the traditional scientific methodology based exclusively on rational analysis and quantitative methods. The traditional scientific method has achieved tremendous results in understanding and harnessing the physical nature. This is because laws of matter, at the macro level, are rigid, fixed, mechanical, repetitive, predictable and therefore amenable to rational analysis. But the laws of human life and mind, which shape the collective life of man, are much more flexible, plastic, nonmechanical and unpredictable. To understand the laws of life and mind and their consequences requires a more than rational intuition and an intuitive methodology of enquiry. This doesn’t mean the traditional scientific method is entirely invalid in the realm of mind and life. The essence of the scientific method is unbiased and impartial observation, discerning the pattern behind the observed data and arriving at a hypothesis. This approach has a universal validity in every quest for knowledge and truth. But the instrument of analysis need not be confined to reason. It can be an intuitive analysis. For, the laws of mind and life are not entirely rational. So any attempt to extend rational analysis to these deeper and inner dimensions of life is likely to fail beyond a certain point. And the methodology of research has to be more qualitative, subjective and interpretive than quantitative and empirical. (2) In assessing the quality of research much greater importance has to be given to the contribution of thought to the advancement of knowledge in terms of new insights, fresh synthesis and alternative ways of looking rather than on the analytical or empirical rigour. The second limitation of modern social sciences is that its psychological base is modern psychology, which is itself an infant science groping in the fringes of the subconscious and subliminal realms of the human psyche and doesn’t have the full understanding of the fathomless depths and mansions of the inner being of man. And our collective life is nothing but the outer expression of our inner being. So we cannot hope to have a deeper, fuller and integral understanding of our collective life without a similar understanding of our inner being. The ancient eastern psychology was much more advanced than that of the modern western type. The yogis and sages of the east explored extensively all the heights and depth of the human consciousness from its lowest subconscious regions to its deepest and the highest superconscious realms. As the well-known founder of Depth Psychology, Carl Jung, writing on Eastern Yoga points out: “Psychoanalysis itself and the lines of thought to which it gives rise¾surely a distinctly western development¾are only a beginner’s attempt compared to what is an immemorial art in the East.” (3) However, the ancient eastern psychology is predominantly individualistic with an emphasis on individual spiritual salvation. But for social sciences, apart from a comprehensive understanding of individual psychology, we need a similar understanding of collective psychology which means understanding of the laws and process by which the inner being of man expresses itself in the outer collective life. Eastern psychology did not pay much attention to this domain of knowledge. However, in ancient Indian social philosophy there are some luminous hints, which can be explored further. However advanced or learned we are in our specialized domain of knowledge, sometime we may have to get back to the basics, which means to the textbook, encyclopedia and the forgotten wisdom of the past in order to spring forward to the future. This may appear elementary, puerile or regressive to an advanced student or researcher in the subject. But it gives a continuity of perception of the manifest actualities of the past and present, which may lead to an insight into the unmanifest possibilities of the future. So let us briefly examine some of the basic definitions of social sciences. The scope and range of modern social sciences includes disciplines like sociology, anthropology, political science, economics, history, jurisprudence, penology, social work, psychology, social psychology, geography, philosophy, ethics, education, and comparative religion. Overlapping the social sciences in their social implications are such studies as biology, medicine and linguistics. To sum up, we may define social sciences as the study of the individual and collective life of man in their relationship with each other and with the surrounding environment. The aim of social sciences is to understand the basic laws and the underlying factors, which shape this complex web of human relationship that constitute the social organism. The pragmatic objective of social sciences is to apply this understanding for the progress, well-being and transformation of the human society. The scope and range of social sciences are so broad and varied almost any human activity, except perhaps pure physical sciences like physics or chemistry can be included in it. This is because a human being is not an isolated Monad distinct and separate from the surrounding environment. Collectivity is the expression of its constituting individuals and the individual is a part of the collectivity, not in the sense he is an insignificant cell in the collective mass, but he is linked with others in a mutually interdependent and interacting unity. So, almost every human activity has an individual and collective dimension and therefore can be included within the broad ambit of social sciences. The integral view accepts, in general, these modern perceptions on the meaning and scope of social sciences. But it will give a deeper and broader orientation to the subject. In this approach, the aim of social sciences is to search for the deepest, universal and integral truth and law or Dharma of human life and society as a whole and also in every activity of human life like for example education, business or politics. Let us now explain briefly the terms we have used here. By “deepest” we mean not only the laws and process of the outer phenomenon of the society but also the deeper psychological and spiritual causes behind the outer social form. In other words, as we have already mentioned, to understand the laws and processes by which the inner psychological and spiritual forces within man and also in cosmic Nature expresses themselves in the outer life of humanity. By “Universal” we mean a “global” perspective, which perceives the universal laws of human society and also their unique and particular expression in each activity of human life like economics or business. It also means what is called in modern thought as “systemic” view which sees each organ or activity of human society or life as part of a larger totality of life, in its relations with the whole and its relations with the rest of other organs or activities. Take for example the organ of economics. We have to understand the economic system not only in its inherent nature and laws, but also as a part of the universal physical Nature from which it draws its material resources, the surrounding social environment from which it draws its human resources, the cultural environment from which it draws its values and ideals and the political system to which it has to submit. By the term “integral” we mean embracing all the dimensions of the individual and collective life of man: the inner realms of the mind, heart and soul and the outer material, economic, social and political life. Is there some examples of such a deep and broad approach to social theory and practice in the past from which we can draw helpful hints for further and future research? As we have hinted earlier, there is such a deeper approach in the ancient Indian social thought and practice, especially in the Vedic thought. This ancient Indian thought, especially its later versions, may not be perfect. But it provides an example of a psychological approach to social organization and development. Let us now briefly examine the insights of this ancient Vedic wisdom on human society. In the Vedic vision, both the Individual and the Collectivity are the equal expressions of the Divine Being. The outer collective life of man is the expression of the four fundamental psychological powers in Man, which we may call as Mentor, Marshal, Merchant and the Worker. First is the intellectual, ethical and aesthetic being which seeks for knowledge, values and ideals, the power of the Mentor. The second is the will and vital force of the Marshal, which seeks for power, strength, mastery, conquest, achievement, expansion. The third is the powers of mutuality, coordination, organisation, and harmony, which seeks for harmonious relationship and an efficient, productive and practical adaptation with life, people and Nature, the power of the Merchant. The fourth is the faculty of the physical being with its urge for work and service and material execution or craftsmanship, the Worker. One of these powers may dominate or lead in the soul or nature of the individual, determining his typal nature as Mentor or Marshal, Merchant or Worker. In the outer collective life these four-fold psychological powers in man express themselves through their corresponding four-fold social organs: Culture, Polity, Economy and Labour. The Mentor through Culture and its activities like religion, ethics, education, scholarship, learning, philosophy and literature; the Marshal through Polity made of government, administration, leadership, laws and order and defense; the Merchant through he Economy made of trade, commerce and professions; the Worker through the labour-force in the lower levels of the social hierarchy. In a schematic presentation of the Vedic social paradigm, there will be at the apex the Divine and His Four-fold Cosmic powers, which express themselves in the human psychology as the four human types and four psychological powers of the Mentor, Marshal, Merchant and Worker, which in turn manifest in the outer collective life as the four organs of the social body: Culture, Polity, Economy, Labour. The Vedic ideal for the individual is to organize and integrate the four-fold powers of the Mentor, Marshal, Merchant and Worker around the innermost spiritual center of the individual. The Vedic social ideal has two aspects or dimensions. In the social level it is to make the four social organs work together in synergic harmony for the common good of the social body as a whole. At the spiritual level it is to make the human society into a conscious expression of the four-fold cosmic powers through their corresponding human instruments and social institutions. The outer social organization and hierarchy should be a conscious expression of the inner psychological organization and hierarchy of powers and faculties within man. In Indian psychology the consciousness of the Spirit or the Self beyond Mind is the highest level of the inner hierarchy in man. Next comes the rational, ethical and aesthetic faculties of the Mentor and the will and vital-force of the Marshal, more or less in the same level. Then comes the faculties of the Merchant and in the lowest level, that of the Worker. If the outer social organisation has to reflect this inner hierarchy then those who are united with the consciousness of the Spirit, the Seer and the Sage have to provide the overarching vision, values and ideals to the society. The Mentor and the Marshal types, representing the highest intelligence and will of the community, under the higher guidance of the seer and the sage, will provide the top leadership to society. The Mentor with his mental and ethical power shapes the cultural life of the community. The Marshal with his vital energy and will, sitting in positions of power in Polity, will enforce the Vision and Thoughts of the Sage and the Mentor in the outer life. In the lower levels of the hierarchy, the Merchant will organize and manage the Economy, and the Worker will give the material form to whatever that is conceived or created by the Mentor, Marshal or the Merchant. Thus we can see, in the ancient Indian social thought, we have a social theory and practice based on the spiritual and psychological dimensions of human life. We are not suggesting that this Indian social paradigm can be applied as it is to the present or future society. It needs much modification and corrections based on the social and political thoughts, experiments, experiences and needs of the modern age. But it provides a broad framework and throws some luminous hints, which can be developed further. The other significant feature of ancient Indian thought which has a living relevance for the future of scientific thinking, especially for social sciences, is the integration of philosophy, ethics and science. The ancient Indian idea of science was embodied in the Indian canonical literature called Shastras. In ancient India every art and science or activity like painting, music, poetry, politics, religion, administration, war, enjoyment and even highly specialized activities like rearing horses or elephants was put under the yoke of Shasthra. A Shasthra, in its original conception, is a comprehensive book of knowledge made of three components. first is a philosophy which views the field of knowledge or activity in the light of a cosmic vision and the highest spiritual aims of life; second is an ethic which lays down the higher values and ideal which must govern the activity; and third is a science which elaborates principles, methods and techniques of practice. An important point to be noted here is that ancient Indian science is not value neutral like the modern western sciences. The aim of Indian science is to discover the highest Dharma of life and each activity of life. The Indian concept of Dharma has a scientific as well as an ethical dimension. In a scientific sense Dharma is the universal and impersonal laws and principles of Nature. In Indian thought Nature means not only physical and biological Nature as in modern science. Nature is the creative Energy of the Spirit and the source of all physical, vital, mental and spiritual energy in Man and in the Universe. So Nature means Cosmic Nature of which our human nature is a part. In the ethical sense Dharma means all the values, ideals and standards of conduct which are in sync with the laws of Nature, which help us to live and grow in harmony with the eternal and evolving laws of Nature in all the levels of our being—inner and outer, physical, psychological and spiritual—and therefore lead to the progressive and integral well-being and fulfillment of human life. In this Indian perspective modern science of ecology and environment is an important part of Dharma because it helps us to understand and live in harmony with the dharma of physical Nature. But modern ecology is only one aspect of dharma. In a more integral approach there has to be a similar attempt in the other and higher dimensions of life like the mental, moral and spiritual. This is the Indian vision of Science. Modern science, especially social and psychological sciences, which study human nature and life, will be immensely benefited if it can broaden its horizons with this dharmic vision of science based on a deeper and greater ecology. We may add to this Indian vision one more factor: vision of the Future or still better, a historical perspective forward integrated into the future, which means a vision of the manifest potentialities of the past, present actualities and future possibilities viewed in an evolutionary perspective. The word “science” is derived from a Latin word which means to “know” or comprehend. So a perfect science must strive to know life comprehensively and integrally in all its dimensions. The integral approach accepts in principle the psychological and spiritual approach of Vedic seers and thinkers to social development. But it will endeavour to give a new form to it and correct some of the defects, which have crept into it in the later periods of Indian history. In this integral view, both the Individual and the Collectivity are in their inner most essence, expressions of the universal Consciousness of the Spirit. The objective of social development is to promote the evolution and development of the individual and the communal consciousness and felicitate its integral self-expression in the outer life. But what is consciousness? There are many ways of defining the concept of consciousness. We have to adopt a concept which is appropriate to the subject we are studying. For example, for a student of psychology or yoga, the concept of consciousness as Awareness, and the Energy inherent in it, may perhaps lead to clarity and insight. But for social sciences, we may use a simpler definition as the inner being of the individual and the community with the soul or the spiritual center beyond Mind as its deepest and inner most core. Consciousness includes the consciousness of our Soul or spiritual being which is the true self of the individual and the community; consciousness of our Mind which is the source of our thought, knowledge, values and ideals; consciousness of our vital being which is the source of our emotions, desires, passions, sensations and vital energy; and finally consciousness of our Body. The outer life of the community and its various organs like economy, society, polity or culture is the external expression of this inner being or consciousness of man. By the term “development of consciousness” we mean the inner development or the development of the inner being of the individual and the collectivity. The path or process of this inner development is yoga. By the word “Yoga” we do not mean the physical asanas of hatha yoga or meditation, which are the popular prototypes and images of this ancient Indian Science. In this approach, Yoga means, a scientific and systematic application of an integral psychology for the inner development of the individual and the collectivity with a predominant emphasis on the development of the spiritual dimension in man. In the ancient Indian thought, especially in the post-vedic thought, society is only a framework of experience for the psychological and spiritual progress of the individual towards his spiritual salvation. But in the integral view, the aim of this inner development of the individual is not solely the personal spiritual deliverance of the individual. It is also a progressive flowering of the faculties, powers, and potentialities of the four-fold being of man made of his body, life, mind and soul. Thus, in this view, society is not merely a shadowy background for the lonely spiritual liberation of the individual. It is a field of experience for the progressive unfolding of the human potential in all the levels of human existence—physical, vital, mental and spiritual, —and their progressive self-expression in the outer life, which will ultimately transform the human society. In the traditional Indian thought the aim of social development is to provide a favorable and helpful outer social framework for the individual to ultimately escape from the society. But in the integral view the aim of social development is, as Sri Aurobindo points out “perfection of the individual in a perfected society” (6) which means, an integral spiritual perfection of the individual, which when expresses itself in every activity of the outer life, will lead to a similar perfection of the society. 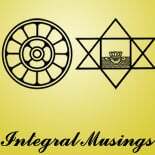 This integral aim, for its complete realization in human society, requires two factors. The first one, and the most important is a culture and an education which leads to a progressive internalization of a set of ideals in the consciousness of the community. They form into a quintuple: Liberty, Equality, Fraternity, Progress and Full Development of the Human Potential. The first sets of ideals are the triune values of French revolution: liberty, equality and fraternity, which are the foundations of social sustainability. We may broaden the scope of fraternity to include not only humans but also all creation or the totality of Nature, which is the aim of modern environmental movement. The other ideal is the modern ideal of progress, which in the integral view includes both inner and outer progress. To achieve sustainable progress, the outer progress in the material, economic, ecological, social dimensions have to be a spontaneous outer expression or out flowing of the inner progress in the mental, moral, psychological and spiritual dimensions. The fifth is the Vedic ideals of integral development of the four-fold human potential, organized around the spiritual self of individual. When we say “internalizing” of these ideals, we do not mean merely inculcating them in the thoughts and sentiment of the surface mentality by mental education, though this is necessary as a preparatory step. But in a psychological and spiritual perspective, “internalizing” means making these ideals concrete, experiential realities in the consciousness of people, feeling them as concretely as we feel our body. For example, internalizing fraternity means not merely having an idea or sentiment of fraternity in the mind. We have to proceed deeper and further and live in a consciousness of inner fraternity felt in the depth of our heart and soul, where we can feel all others as part of our own self. This deep internalization of ideals can be achieved only through an education based on the principles of yoga. The second factor is a flexible, dynamic and evolving social organisation which felicitates the progressive outer actualization of this inner realization, in the material, economic, social and political life of the community, from within outwards. Rennie L.David, Watson Kimberged, Montero M Aethea, The ‘Rise of Qualitative Research’ Canadian Psychology, 2005, 3 (1), p.41-53. Jung C.G, (1953) Modern Man in Search of the Soul, New York, Harvest Books, p.216. Yunus, Muhammad (1998), Banker to the Poor, Dhaka, The University Press, pp.235. This entry was posted on April 6, 2012 by integralmusings in Society & Culture.